Monday night I was talking on the phone to my sister, discussing our travel plans to China next month** and I ran upstairs to get my passport from it’s very snug little spot in our lock box. Lock box. I like that term, it makes me laugh. Anyway, I came down with my little prize and gave my sis the numbers she needed and we continued to plan and talk and talk and plan. You know, like we girls love to do. Fast forward to to Wednesday afternoon, when it was time for me to get my passport in the mail to the courier. I carefully fill out my visa forms, no do-overs thank you, and tape my lovely unmakeuped picture to the top right corner. I even throw a paper clip onto the whole get up, just for safety. 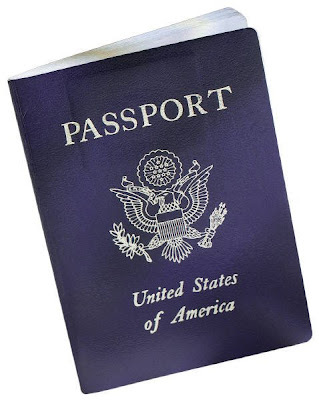 I complete my FedEx slip and slide it into my very last FedEx envelope (thank You, Lord) and go for my passport. Huh, where is my passport? It was here two days ago. On my desk. The desk that has full access to 8 grubby hands belonging to 4 children 4 and under. Hands that love to visit, in addition to my desk, the backyard, playroom, and gasp! the trash can. My mind is spinning with that realization. That and the fact that I am suddenly painfully aware that our trash was picked up Tuesday. Tues-day. Tuuuuesday. So it’s gone. Mildly panicked, I gather the unpaid laborers children to come help. “Okay kids! Mommy needs your help. I am looking for a little blue book. About this big – with hand gestures – and it has mommy’s picture in it! Have you seen it?” I question the children individually as well, to assure an honest answer. No one seems to remember it. I up the ante and offer a finder’s fee of candy. 5 pieces of candy, in fact. That gets some fire under their fannies and they disperse in different directions looking for this ‘little blue book’. Soon I realize that not only are we not making any progress, but that the kids are, in the process, trashing the house. And they have an excuse. So I run upstairs to get daddy’s passport to give them a clue, let’s make this into a treasure hunt! We search the bookcases, under couches and chairs, in drawers and under beds. I am struck with how much stuff I have that I don’t give a rat’s patootie hoot about. Stuff I could not lose, even if I tried. And I’m suddenly annoyed by how stinkin’ small a passport is. And how ridiculously plain a passport is. I mean, blue? Dark blue? Why couldn’t they make a passport neon orange and about the size of a cereal box? Surely I could find that in this house. Who cares about pickpockets and international travel if you can’t find the darn thing?? Who?? Feeling my panic crank up a notch, I call my sister and give her the bad news. She, in her usual fashion, calms me down and tells me to take a deep breath and maybe step away from the hunt for a few. Then she offers the kids $20 to whoever finds it. Dust is flying at this point, especially after I explain to Sophie that $20 could buy her a Build-A-Be@r… just like Jane has, she informs me. Jude wakes from his nap and I show him daddy’s passport and ask him if he has seen it. He, incredibly, replies with a nod. Exhilarated, I offer him the candy bribe and off we go, with me following behind him like a kid at Christmas. Jude leads me downstairs and into the boys room. Then to the desk… he knows exactly where he’s going. Then he, with assurance, grabs Dalton’s black Game Boy and hands it to me. My hopes pop like an overinflated balloon, we are back to square one. just. like. that. Soon, hubby arrives home and asks if we’ve looked here. And there. And under there. Yes, yes and yes. Still no passport. It’s now 6:00PM and the FedEx pick up is 6:30. No way, even if we did find it, that we could make it. I rationalize that I can overnight it if we do find it. But I’m losing hope and realization is dawning that I’ll be calling the National Passport Center in the AM to see about an expedited passport. ugh. Then Chris asks me if I might have left it in my pockets. I don’t have pockets and if I was wearing pants on Monday night, I would have never put my passport in there. It would be squished. Geesh, men. But I can’t help but go with that thought. What if I did have it, but in my hand? Where would I have put it? Because I am the sort who doesn’t think about things too hard, I am constantly multi-tasking and most things end up laying out in the open, unprotected, until my husband comes home and puts it all in it’s appropriate place. That’s why we’re good together, I go and do and he comes behind and redoes. With order. I run upstairs and move the neatly folded pile of laundry my husband has laid on top of my dresser. And voila. There she sits. Never have I been so stinkin’ happy to find a little dark blue book. With an unflattering picture of myself in it. My wonderful hubby takes the beloved FedEx envelope to the drop box and it is deposited at 6:29. One minute to spare. I have a whole new appreciation for the ordinary. Thank God. **YES! I am going to China with my sister! To get her beautiful boy, Cole!! Thanks to my mother, who decided she cannot go, I will be traveling in her place as travel companion and photographer extraordinaire (or just ordinaire). And amazingly thankfully, my babysitter, Chris’ mom and my friend Colleen have all agreed to come together to care for my kids while Chris is at work during those 2 weeks I’m in China. It’s gonna be F.U.N. around here!! Can you say “par-tay“?? Cuz’ that’s what I’m sayin’. Oh my goodness, my heart was pounding while reading your post! I am SO excited for you and your sister!! CJ and I took my sister with us to China and let me tell you, I was so grateful to have my sis with me. I can’t wait to read your travel journal!! I am so excited you’ll be able to go, but girl, you’d better take better care of that passport in China. Oh, and yes – please send me the photos. I can start working on the site next week. did chris get the 5 pieces of candy and $20? so happy you are traveling iwth your sister!!!! GOOOOOOD times! So happy you can go with Angie! And hey…you CANNOT take an unflattering picture. Impossible. You are deluded. Love you. I hope we can meet up in Guangzhou. That would be a party and a half! I think I would have had a heart attack!!!!!!!!!!!!!!!!!!!!!! I can not wait to see your beautiful pics from China! Especially the ones with that adorable little Cole in them!!!! Awesome is all I can say about that trip!!! I can totally relate!!! We were preparing all of our documents for our dossier and realized that my passport was missing. I was frantic!! I searched the internet to find out how I could go about replacing it – uggh! Then I started to think that possibly it had fallen out of the file folder in our cabinet. After a quick search, we found it. Nothing like a little stress to brighten your day!! Wishing you safe travels to China. You sound just liek me when I can’t find something! Glad it turned up and so happy to hear your going to China with your sister. When do you leave? So awesome that you are going to China with your sister. As supporter and photographer, YES, extraordinaire!!! Just wonderful! WHEW!!!! You had my heart a-thumpin', girl!! Oh the suspense, the drama! Soooo glad you found it! You lucky mama, you, China-bound with your sister!!! FABULOUS!!! I was holding my breath for you, Stefanie! I’m so glad you found it. How great that you are getting to travel with your sister!! I am always losing things because I do too much at a time and don’t pay attention to where I put it. The one I lose the most are my keys. Several times I have lost my keys and offered $5 to the person who found them. Five dollars is a big incentive in our house! I think I need a system to not lose them in the first place!!! I am just laughing at the imagined site of the kids tearing through the house for a few pieces of candy and Jude leading you to a gameboy! Gotta love those guys! I am SO thankful you found it! When will you be home?!? So thrilled that your nephew is so close to coming home! Man, I am laughing and crying at the same time. I am so glad you found the passport and loved your family’s hunt for it. I really thought Jude knew where it was. 🙂 How cool you are going with your sister. I can’t wait! It’s so wonderful you’ll be heading back to China with your sister. What a special event to share together!! Hysterical post…though I know it wasn’t too funny for you at the time…glad you found it:-). I was dying reading this post…I did laugh when you mentioned the black DS ROTFL I am so happy for you that you get to travel with your sister. What a wonderful trip you two will have!!!!! Is there going to be a journey site? WOW! I don’t know what my heart stopped about more! !…the passport or the fact that you get to GO GET COLE!!! INCREDIBLE!!!! So excited for you! Can’t wait to follow along! Wait, we get to follow right??? LOL! Too funny!! I am picturing you frantically looking for that little blue book and crackin up with Jude’s contribution. I am so excited you get to go with Angie!! That part about Jude and the game-boy had me laughing out loud at the information desk at work! (Boy did I get some strange looks!) I’m so glad you found it and so happy to hear that I’m not the only one who does stuff like that! And it sounds like you get the candy! Oh How special that you are going with your Sis!! Yall are going to have a blast! I’m happy for you. And,.. boy oh boy.. were you calm about the misplaced passport!! I would have freaked!! lol!! Congrats on what’s going on with your site! It is a big hit in blogger land. Everybody has it on their side bar! LOL! I need to add one too! I think it’s a great tool!! I have been laughing hysterically over this post for 2 days now.